Micro-cut shredder offers superior protection with particles 10 times small than standard cross-cut shredders. Auto Reverse stops and reverses paper if a jam occurs. SafeSense Technology stops shredding when hands touch the paper opening. SilentShred offers ultra-quiet performance for shared workspaces. Energy-saving Sleep Mode feature shuts down the shredder after 2 minutes of inactivity. Powershred 99Ms Micro-Cut Shredder shreds 12 sheets per pass into 5/64" x 5/16" micro-cut particles (Security Level P-5) at 11' per minute into a 9" paper entry. Perfect for 1 to 3 users, the shredder shreds for up to 15 minutes before a 25-minute cooldown period is needed. 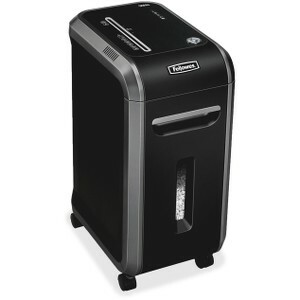 9 gallon pull-out bin holds more than 80 percent more micro-cut particles per gallon than standard cross-cut shredders. 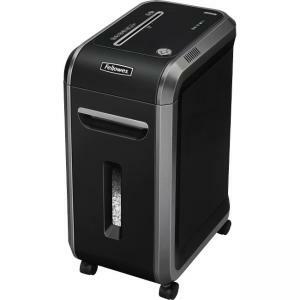 Shredder also features a durable plastic casing and can shred staples and credit cards.